Cuban patent laws are codified in Decree 68 of May 14, 1983.1 In its introductory paragraphs, it is specified that the new laws are intended to replace the former laws considered obsolete. The new laws were necessary to conform to Cuba’s current development, the construction of socialism, and the fact that Cuba is a developing country and a member of the socialist community.2 These prefatory words should alert an intellectual property lawyer that the social policies intended to be advanced are different. Hence, results may be unpredictable in litigation unless the practitioner takes these objectives into consideration. Which brings us to the fact that the U.S. embargo or blockade3 makes many of these considerations a mere academic exercise from a commercial standpoint at this time. Furthermore, and as in most developing countries, patent litigation is not common in Cuban courts keeping the enforceability of patent laws under a question mark. On the other hand, there may be practical interest in the prior references that could be generated in that country (patents, publications, reduction to practice, etc. ).4 Cubans are resourceful, educated, and exposed to cutting-edge technology in certain areas. As it is described below, several multi-party treaties join this republic with other industrialized nations providing for reciprocal rights that affect us more directly. The competent national authority administering the patent and trademark laws was the Oficina Nacional de Invenciones, Información Técnica y Marcas (ONIITEM), which is now the Oficina de Marcas y Patentes de Cuba. The restrictions upon Cuban citizens under the communist form of government prevents them from availing themselves of the incentives extended by the characteristic exclusive rights extended by intellectual property grants. Rather, the inventors are required to go through their employers or labor centers, and the authors cannot freely negotiate their copyrighted work, even if they take the initiative to register it or even promote it. It is through state-owned corporations that most of the business activity takes place. Again, Cuba’s commercial activity may not be of consequence, but its research undertakings have gone beyond those of comparable countries, specially, in biotechnology and other cutting-edge areas. It is reasonable to assume that with the attention patent laws have received in the international business arena, the indifference towards Cuba’s laws and inventive activity should not be discarded even if the U.S. embargo is not lifted. American industries will suddenly find a Caribbean Taiwan a few miles off its shores. The new law also adds provisions for preliminary relief (even ex parte) and customs-enforcement measures. These new provisions are intended to bring the country in line with the requirements of the World Trade Organization (Trade-Related Aspects of Intellectual Property, TRIPS). The preliminary relief could take the form of a temporary restraining order or seizure. These orders can last up to 20 days. A judicial action needs to be instituted before their expiration if the applicant wants to maintain continuity in its effect. The preliminary relief can also be obtained through an ex parte application.10 Similarly, preliminary customs injunctive relief is valid for 10 days and, for good cause, extended for another 10 days. In both instances, a bond needs to be posted to guarantee any damages in the event the proceedings were not justified. These procedures are similar to those used in most countries to fight piracy. There have been no cases yet using these new provisions, to the best of the author’s knowledge. The test for deciding whether a mark is registrable over other previously registered marks or applications is not clear. The new law uses different terms in connection with this keystone issue in trademark law. The United States test basically includes a determination of whether purchasers are likely to be confused as to the source of goods or services. The U.S. Patent and Trademark Office, in its administrative examinations, follows this test with relatively minor variations. 11 The new Cuban trademark law uses different language for this concept. In Article 42 (e), a mark registration owner is granted the right to exclude others who use designations that could cause the registrant an economic harm and it is understood that probability for likelihood of confusion is presumed for identical marks used for identical services or goods. In Article 57, the words “risk of confusion” are used in the context of a registration annulment proceeding. Article 17(d) also refers to risk of confusion or association for. In the U.S. (common law) legal system with its characteristic significant deference to judicial precedents the different words could be tantamount to a quagmire (judicial second-guessing of legislative intent with no debate record). In civil code countries, this is not important since the codified laws are interpreted de novo for each case. This author believes, however, that the subtle differences between possibilities and probabilities will not preoccupy Cuban jurists in this field, at least not for a while. Another interesting aspect of the new trademark law can be found in Chapter V, Sections Two and Three. Section Two refers to a procedure for annulment of mark registrations based, inter alia, on the existence of superior relative rights of third parties such as the owners of previously filed applications or registered marks, or even famous marks that became notorious prior to the junior mark. Section Three deals with cancellation procedures and is primarily concerned with general rights of the consumers, such as injecting terms in the public domain or the characterization of genericness. Section Two, dealing primarily with private rights, does not have a statute of limitation while there is a statute of limitation under Section Three. This contrasts with U.S. trademark laws where the consumer (not represented in the typical litigation proceeding) has superior rights vis-á-vis the property rights of the mark owner. This may be a legislative lapse in a society that is primarily concerned with collectivism over private property rights. Cuba is a member of most, if not all, treaties that relate to the protection of intellectual property rights.12 Membership in these treaties is a source of much needed hard currency for the embargoed/blocked country.13 But beyond that, it has been instrumental in injecting trademark concepts to executives in state-owned companies and especially those entities concerned with exports. Until a few years ago, Cuba did not police its marks or did it reluctantly. This has changed with well-publicized U.S. cases like those involving the marks Havana Club, Cohiba and others. The old thinking, and still kept by many Cuban jurists, is that it is an exercise in futility to try to enforce Cuban trademark rights in the United States. However, this attitude has changed lately as Cuban executives become more knowledgeable on intellectual property matters. The cases litigated in Cuba typically do not progress beyond the trial level. And most of them involve appeals from administrative registration refusals. Many cases involve facts relating to consumer expectations that have not occurred in four decades.14 One of these cases involved the American mark “Kool Aid.”15 The Cuban Intellectual Property Office sought to cancel the registration for non-use and, on appeal, the court16 excused the non-use based on force majeure (the U.S. economic blockade) and reversed the administrative decision of the Office. In sum, it remains to be seen how the Cuban Intellectual Property Office will apply the new trademark law and the courts interpret and enforce it. Cuba is a member of most multilateral international treaties in effect relating to intellectual property law. Its international commitments include: Paris Convention for the Protection of Intellectual Property, Locarno Agreement on Industrial Designs Classification, 22 Patent Cooperation Treaty (PCT),23 Strasbourg Agreement on Patent Classification,24 World Intellectual Property Organization (WIPO), Budapest Agreement on Microorganism,25 Madrid Arrangement (trademarks),26 Madrid Protocol (trademarks), 27 Lisbon Agreement on Appellations of Origin,28 Santiago Convention of 1923 (trademarks), 29 Nice Agreement on Classification of Goods and Services,30 Vienna Agreement on Classification of the Figurative Elements of Marks,31 Nairobi Treaty on the Protection of the Olympic Symbol,32 Pan- American Convention of 1929 (trademarks),33 Buenos Aires Convention of 1910 (patents),34 Universal Copyright Convention (UCC) and Berne Convention for the Protection of Literary and Artistic Works.35 Additionally, Cuba has signed the following treaties that are not in force yet: Geneva Act of the Hague Agreement Concerning the International Registration of Industrial Designs (Geneva, 1999), Patent Law Treaty (Geneva, 2000). 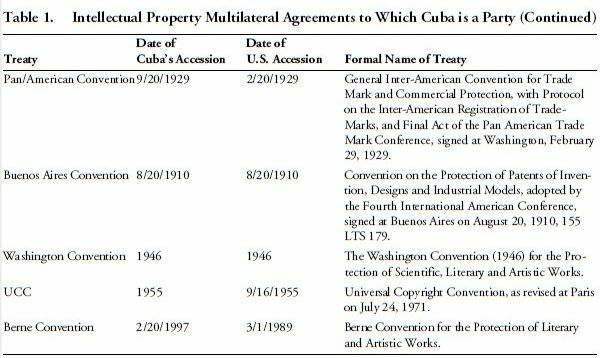 If we look at Table 1, it can be readily seen that Cuba’s international involvement in multilateral intellectual property treaties surpasses, by far, that of the United States. This is also understandable since many of these international treaties provide a source of hard currency to the signatory states, and sometimes even without requiring any filings. For instance, under the PCT, designated countries are entitled to a portion of the fees paid. WIPO regularly distributes these fees and provides technical support to Patent and Trademark Offices in developing countries. Therefore, and in view of the limited internal use for the characteristic exclusive rights granted by intellectual property grants, it is clear that the incentives for accepting these major commitments respond to short-term needs for hard currency, technical support and compliance with the applicable provisions of TRIPS (WTO). The longer-term benefits of stimulating inventors, authors and business persons to invent, create and improve on the quality of their goods and services is as distant as in any of the other similarly situated developing countries in the region. One exception, however, could be the biotechnology field, to which the state has devoted extraordinary resources. In sum, it can be said that Cuba has had intellectual property laws in its books since its colonial days and judging by its membership in most multilateral international treaties in this field, it has created an impressive infrastructure for the protection of intellectual property rights. However, the enforcement of these rights remains as a question mark in the event that its economy is liberalized. Other developing countries with free market economies also have advanced IP laws, but piracy is rampant and lack of intellectual property culture and respect prevent their enforcement. These developing countries are driven by different forces than those driving the developed countries in enforcing IP laws. But, whether foreign countries enforce their laws or not, the intertwined network of international commitments transmit important effects and limitations in our organic laws that need to be taken into consideration. 1. The 1983 law replaced the previous decree-law of April 4, 1936, which in turn replaced several military orders dating back to the U.S. military intervention from 1898 to 1902. 2. The socialist community no longer exists as such today. The characteristics of Cuba’s development are quite different from those of 1983. The development of socialism has probably reached its maximum point, since there is nothing else for Cubans to socialize. Ironically enough, it may be that de-socialization has begun for selected industries, but only foreigners are allowed to participate. Then, the only assertion that remains true is that Cuba is a developing country. 3. The U.S. has maintained that its foreign policy towards Cuba is a bilateral matter, an embargo. Cuba has taken the position that U.S. extraterritorial acts constitute a violation of international law and that its actions constitute a blockade. The international community has sided with Cuba, according to the votes taken on the issue in the United Nations since 1992. 4. 35 U.S.C. §§102, 103, provide that certain activities abroad can bar patentability in the United States. 5. Decree-law No. 68 of May 14, 1983 of Inventions, Scientific Discoveries, Industrial Models, Marks and Marks of Geographic Origin. 6. Decree-law 293 of May 2, 2000. 7. Decree-laws are different from laws in that the former are not approved by the entire parliamentary body but rather by the State Council, which is a sub-set of the full assembly. 8. There has been a proliferation of state and mixed state/private enterprises. However, their creation and limitations still respond to a centralized economic system. After the triumph of the revolutionary government in 1959, all private enterprises were nationalized with the exception of some small tracts of land kept by farmers/workers. 9. With the exception of those in high positions who have traveled abroad, there is practically no consumer culture in Cuba. 10. Chapter 2, Title X of decree-law 203. 11. In re E. I. du Pont de Nemours & Co. , 476 F.2d 1357, 177 U.S.P.Q. 563 (CCPA 1973). 12. Cuba is a member of the Paris Convention, the General Inter-American Convention, the World Intellectual Property Organization (WIPO), the Madrid Agreement, the Madrid Protocol, among others. 13. The controversy of whether the U.S. embargo/blockade laws are bilateral or unilateral measures has been debated for many years in many fora. 14. After the triumph of the revolutionary government in 1959, private enterprise was nationalized with the exception of some small tracts of lands kept by the farmers/workers. 15. Kraft Foods, Inc. v. Oficina Cubana de la Propiedad Intelectual, Judgment No. 428, 2a Sala, Civil and Adm. Provincial Tribunal, August 31, 1998. 16. All appeals from the Cuban Patent and Trademark Office are reviewed by the Provincial Court for La Habana. 17. Revoking the colonial Spanish Law of Intellectual Property of January 10, 1879 (the 1879 Law) and its Regulation of September 3, 1880, for Implementing the Intellectual Property Law (the 1880 Regulation). Other related and revoked laws are Articles 392 and 554 of the Social Defense Code (Código de Defensa Social) providing criminal sanctions for the violation of the copyright laws. Article 554, in particular, has striking similarities with Section 43(a) of the Lanham Act. 15 U.S.C. §1125(a), including copyrighted work in the protection and possible incarceration of up to one year. 18. The National Assembly of People’s Power is Cuba’s one-chamber legislative body. 19. There is an error in the official text of the law, which makes reference to Article 38 when it should be Article 39. This was confirmed with legal personnel at CENDA. 20. Article 39 of the Cuban Constitution, as amended in 1992. 22. Locarno Agreement Establishing an International Classification for Industrial Designs, Locarno Agreement (1968), amended in 1979 (Locarno Union) signed on October 9, 1998. 23. 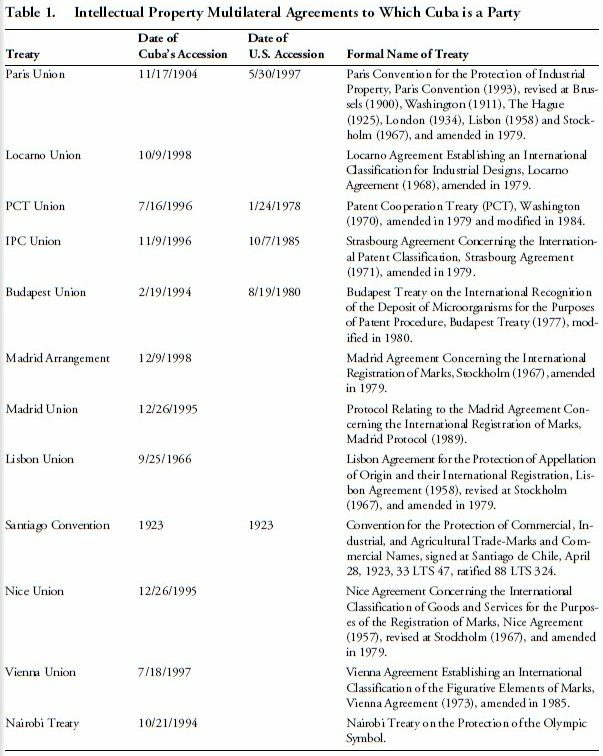 Patent Cooperation Treaty (PCT) (Washington, 1970), amended in 1979 and modified in 1984 (PCT Union) signed on July 16, 1996. 24. Strasbourg Agreement Concerning the International Patent Classification, Strasbourg Agreement (1971), amended in 1979 (IPC Union) signed on November 9, 1996. 25. Budapest Treaty on the International Recognition of the Deposit of Microorganisms for the Purposes of Patent Procedure, Budapest Treaty (1977), modified in 1980 (Budapest Union) signed on February 19, 1994. 26. Madrid Agreement Concerning the International Registration of Marks, Stockholm (1967), and amended in 1979, entered into on December 6, 1989. 27. Protocol Relating to the Madrid Agreement Concerning the International Registration of Marks, Madrid Protocol (1989) (Madrid Union) joined on December 26, 1995. 28. Lisbon Agreement for the Protection of Appellations of Origin and their International Registration, Lisbon Agreement (1958), revised at Stockholm (1967), and amended in 1979 (Lisbon Union). 29. Convention for the Protection of Commercial, Industrial, and Agricultural Trade-Marks and Commercial Names, signed at Santiago, Chile, April 28, 1923, 33 LTS 47, ratified 88 LTS 324. 30. Nice Agreement Concerning the International Classification of Goods and Services for the Purposes of the Registration of Marks. Nice Agreement (1957), revised at Stockholm (1967) and at Geneva (1977), and amended in 1979 (Nice Union) entered into on December 26, 1995. 31. Vienna Agreement Establishing an International Classification of the Figurative Elements of Marks, Vienna Agreement (1973), amended in 1985 (Vienna Union) signed on July 18, 1997. 32. Nairobi Treaty on the Protection of the Olympic Symbol, signed on October 21, 1984. 33. General Inter-American Convention for Trade Mark and Commercial Protection, with Protocol on the Inter-American Registration of Trade-Marks, and Final Act of the Pan American Trade Mark Conference, signed at Washington, February 20, 1929, 124 LTS 357. 34. Convention on the Protection of Patents of Invention, Designs and Industrial Models, adopted by the Fourth International American Conference, signed in Buenos Aires on August 20, 1910, 155 LTS 179. 35. Berne Convention for the Protection of Literary and Artistic Works joined on February 20, 1997.